The process of Kaparot sweetens and cleanses judgments from us. The Kaparot process can be done anytime between Rosh Hashanah and Yom Kippur before the fast begins. Read detailed explanation in the attached PDF. 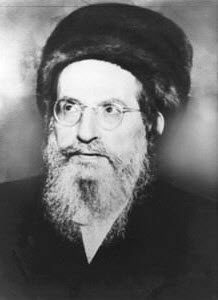 In the writing of the Ari, Rabbi Chaim Vital describes how his teacher, the Holy Ari, was doing the Kaparot with chicken before Yom Kippur. Many people follow this process. I myself decided to do the Kaparot with money because of two main reasons. I do not know a trusted Shochet that will do the meditation of the Ari. The one that does it in the morning slaughtering maybe hundreds of chickens may not check his knife frequently for flaws in the blade that would make the slaughter non-Kosher. It may bring judgements on the chicken’s soul and make it non-kosher. Whoever eats the chicken later may eat a non-kosher meat and that affects the soul negatively. The improper slaughtering turns the act to have the aspect of cruelty to animals and the outcome of the Kaparot may not be as intended or desired. Bottom line is that if you are not sure about the Kosher slaughtering then it’s better to do the Kaparot with money as described below. The Half-a-Shekel is a precept from the Torah. 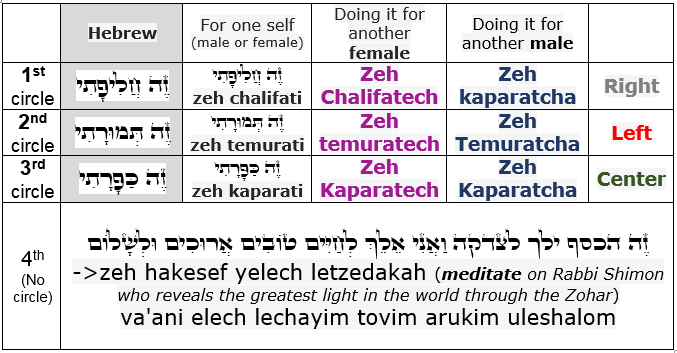 It is used to atone (Kapara) for the soul of the Israelites. The Kaparot process is done any time between Rosh Hashanah and Yom Kippur, preferably early morning on the day before Yom Kippur. Place the money (cash, coins or bills) for Tzedakah inside an envelope or a cloth. Use same amount for each person. Turn the envelope with the money over the head in a circle, counter clockwise once for each of the three lines in the table below. Pause and say the fourth line. Repeat the three times, so you will make 9 circles over the head (yours or your children). You may do kaparot for your children; just choose the related one column below. 3rd this is my expiation (atonement). Give the money that was in the envelope(s) to poor people in true need of immediate food and or shelter. Do it before the start of Yom Kippur by handing out the money, mail it or give it online. Alternatively and mainly, give the money to those who teach you Torah and Zohar because that Light feeds the hunger for the Light that all people need. That is important aspect of Tzedakah that draws the life force that we need in our lives for the coming year and beyond. You may make the Tzedakah by supporting the Daily Zohar projects.